Since the A.V. Club and Gameological staffs are heading out on holiday break (although there will be plenty of Gameological fun next week as our Play The Year feature returns), this installment of What Are You Playing This Weekend? will have to tide us over a little longer than usual. So while you should definitely share your gaming plans in the comments as always, I’d also like to get a parallel conversation going. I’m guessing that many of you, like me, got some video games under the tree/menorah/holiday-icon-of-your-choosing in your childhood years. 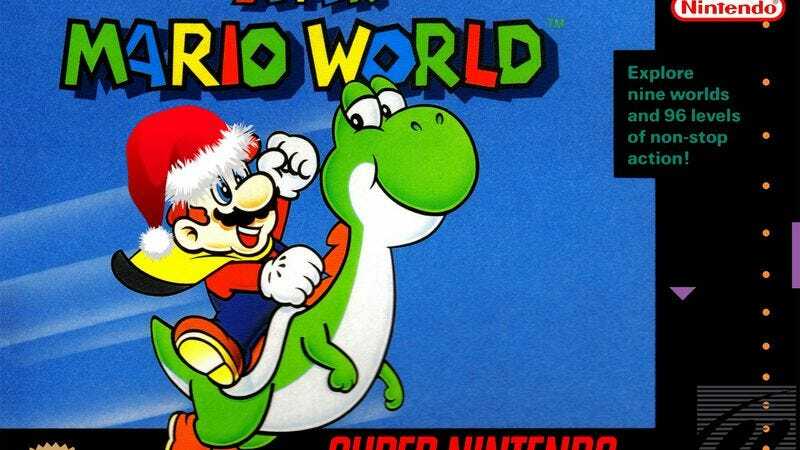 So my question for you is: What video game will forever be associated with holiday cheer in your mind? For me, it’s Super Mario World on the Super NES. The game stands as an all-time classic on its own merits. But whenever I play it, my mind does a Proustian sort of thing and takes me back to a different place and time. I’m eating sugar cookies out of a huge Christmas cookie tin and sitting on a hideous overstuffed recliner couch in my family’s living room. I can almost feel the heat coming off my brand-new, overworked Super NES as I push it into its sixth or seventh straight hour of service. Those school-free stretches of time between Christmas and New Year’s remain some of the best game-playing times of my life. Let’s hear about your own video game madeleines.